Have you seen the other bathroom post for Project Shake Front! There are three total, and although they all have similar colors schemes they are each uniquely different. If I had to say which is my favorite out of the three, I would be in trouble! I think you'll see what I mean. Like much of how things have gone with this project, there's only been a few changes since my initial design presentation. We swapped out the wall lights for these and instead having them be cut, and mounted into the glass, we decided to go with a smaller mirror and mount the lights on either side of the frames, beveled mirror. Instead of the diamond pattern tile, we ended up going with a basket weave instead. I happened on to it when I was ordering the samples from the concept boards so we could finalize the finish material selections. I immediately liked it better than the diamond pattern and so did my clients. And I can say for certain that we have no regrets! It turned out perfectly. Somehow the framers didn't get the memo that we were planning stain-grade floating shelves for the tall storage and unfortunately the framing wasn't perfectly square, so we had to move on to PLAN B which was to add a linen cabinet with closed storage on the bottom and open shelves on the top. We also made some changes with the cabinet pulls. Small format floor tile calls for a floating cabinet, at least that's how I see it! How fun it is to see the small tile peeking out from underneath the cabinet! It doesn't seem like you would need to talk to the framers ahead of time to make sure everything is square but if you are planning floating shelves, better to be safe than sorry and have that conversation ahead of time. 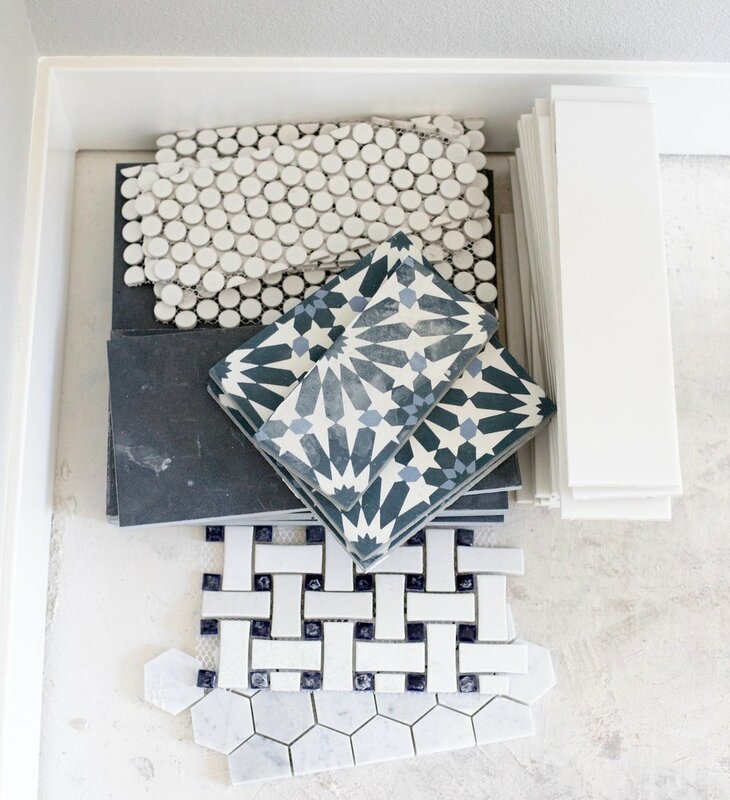 Think of each of the rooms and spaces in your house as part of a greater whole and then plan the color scheme so they have a relationship between them. This approach will make for a well thought-out, refined presentation. Floating cabinets are great for showing off small format tile, but they're also a good idea to use in narrow spaces. Because the cabinet doesn't touch the floor it creates the illusion of a greater sense of space. I can't end this post without a sneak peek for what's to come...and you won't want to miss it!